I hope you had a wonderful weekend. Mine was really relaxing. Yesterday night we had a great dinner at our favorite restaurant (Japanese Cuisine) and made use of some "beauty event" discounts to get some of the essentials, such as the natural lip liner from Chanel and some more fun make-up from MAC. I ended up with nine pieces from MAC MACneficient Collection. I was trying to resist but it didn't work. Worst of all I am eyeing a few items from there holiday collection as well. The star of the collection to me is the MAC Eye Shadow x9 in MACneficient Me! (yes with an exclamation mark!). Previously I have avoided Eye Shadow x9 Palettes simply because the pans are too tiny and I think they are hard to work with. This one though stole my heart with its good pigmentation and mauve pink tones. Also the shades coordinate and blend so well. I definitely recommend checking it out if you still haven't. 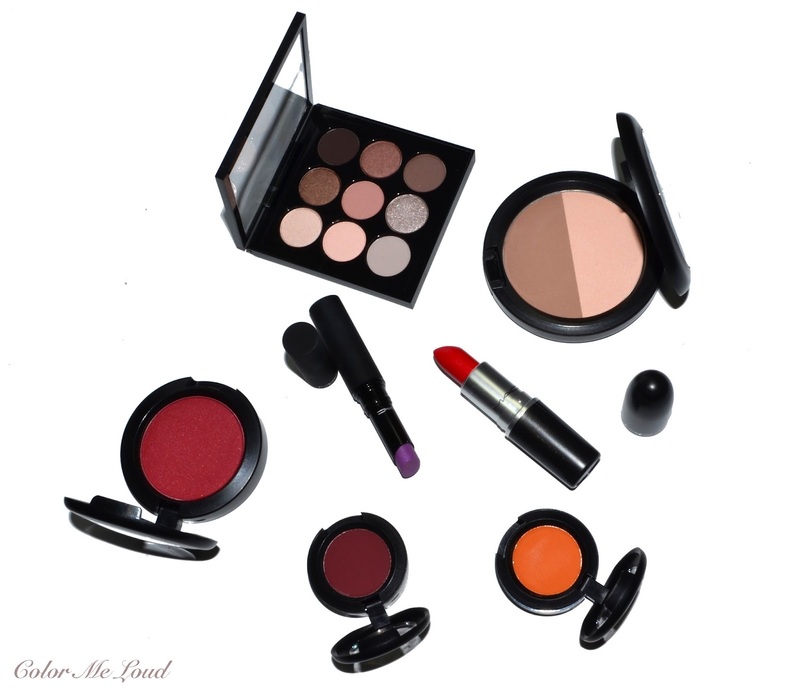 Close-Up: MAC Eye Shadow x9 MACneficient Me! The below swatches are somehow inverted. It starts with the last row and jumps to the first row. The last three of the swatches are the middle row. You can understand it from the stunning Sable, which is a color everyone on earth needs (and phew it is permanent!). This one is in the middle row, right most and on the swatches below is at the end. Other shades I adore are Cool Compliment and Pleasing To The Eye for subtle crease work, which can later be deepened with Dance In The Dark. In The Element is stunning and doesn't produce much fall out during the day. Big love for these. Swatch: MAC Eye Shadow x9 MACneficient Me! Here is me wearing Quiet Type, Dance In The Dark, Pleasing To The Eye and In The Element. I believe I also have Fabulous DNA on the inner corner. 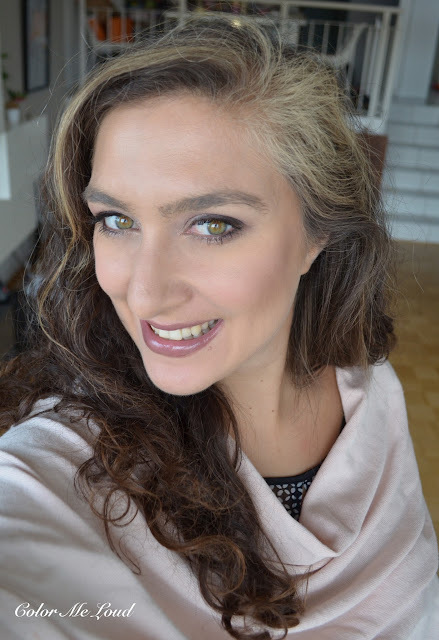 In-action: MAC Eye Shadow x9 MACneficient Me! Below is the look in context. I am wearing MACneficient Me! Eye Shadow x9 on the eyes, MAC Accentuate/Sculpt to bring in some cheek bones and Armani Belladonna Lipstick and Lipgloss from a former limited edition Collection which I love for Fall at the moment. Here is the swatch of Accentuate/Sculpt. 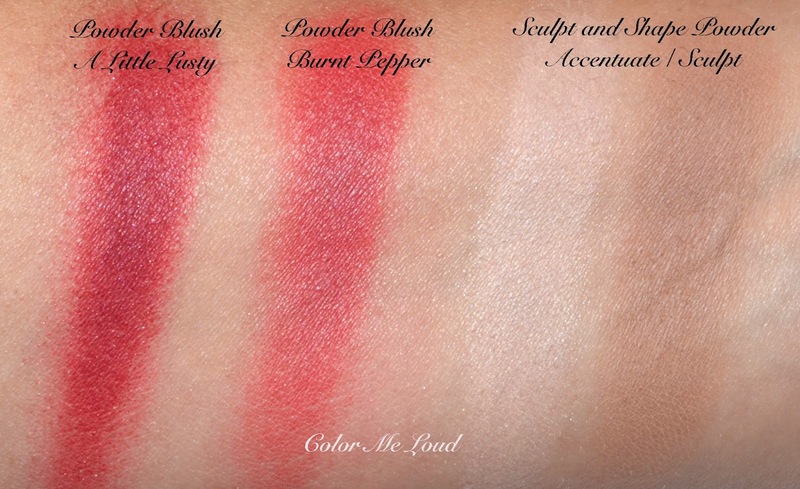 I have previously swatched and compared MAC Sculpt here. It is part of the permanent line-up (might be pro though). I find Sculpt to be a perfect contouring shade for fair to medium complexions. It is less pigmented than Kevyn Aucoin so easier to work with in the morning (meaning harder to overdo). I also picked up two blushes, A Little Lusty was the one everyone was lusting over. I don't know why I followed the crowd there because 1) it feels really dry 2) I hate over blushing ad look like a clown very easily. Given these facts, it was a stupid buy but it happened. I might try to use it on the eyes. What I was actually eyeing was Burnt Pepper but SA told me that it is permanent. So I skipped it the first time around. Then I decided to take advantage of the discount and get it too. Those shades are perfect for fall but terrible on me. I will see what I can do with these and report back. I haven't picked up any of the lipsticks from the collection because I am not a big fan of Patent Polish formula, they dry my lips which are hard to get dry but some lipsticks succeed it that. I was though sent two lipsticks, My Inner Femme which is a stunning bright red with amplified formula. I believe the red lovers will be all around this one. MAC Mattene Lipstick in Strutting Fabulous was my first Mattene lipstick and I have to admit although I like those interesting violet shades (such as this one here from Osbournes Collection), I didn't like Strutting Fabulous. The formula is not very long lasting on me and it also feels drying. So here how Strutting Fabulous looks on me. I have a few interesting violets and grey which all looked somehow wearable but this one is a little off. I might have to work more on the rest of the make-up after all. All tips would be welcome. Yesterday I couldn't resist but got Frozen Violet Pro Longer Paint Pot, it is gorgeous. I have to yet try it on my eyes though. Everyone's Darling was the eye shadow I was eyeing. Although I usually don't like MAC's matte formula, I like that Everyone's Darling doesn't feel patchy. 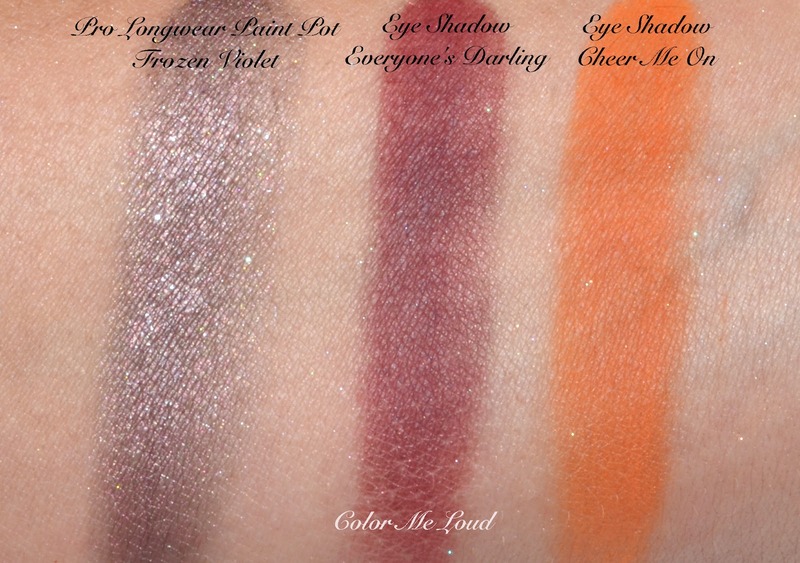 Cheer Me On is a pumpkin shade which I would no where on earth have gotten but it was a sample from PR. Good thing it was, a little challenge to make it work *grins*. Anyway Cheer Me On is a little drier than Everyone's Darling but if you know and like MAC's Matte formula, it is nothing too bad. I personally prefer Matte2 formula over these. Here is the last and most unusual FOTD. I combined two shades which I wouldn't think would work but something fun came out of it. 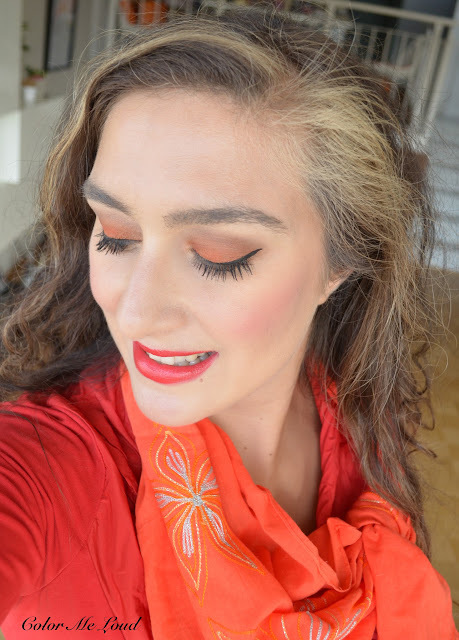 Here is an orange red combination FOTD with Cheer Me On and My Inner Femme. 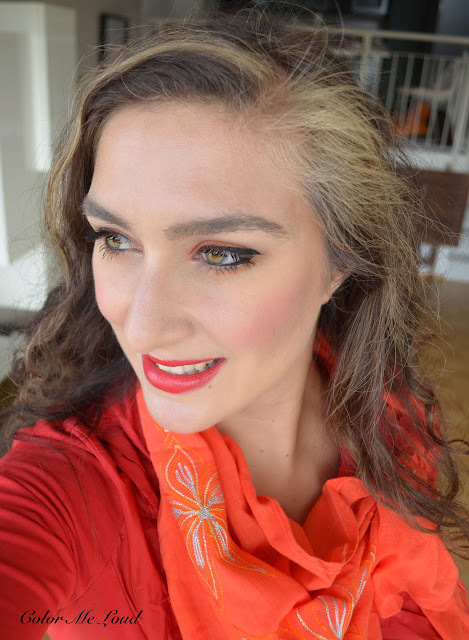 I supported the make-up with red blouse and orange scarf. I also used lots of black eye liner, which I usually don't use. Hope you like this bit of change. Funny thing is that I received many comments saying that the FOTD at Suqqu Base post was one the best in the last months and there I was wearing no eye make-up! This made me think that maybe I should go easy on eyes. I usually go full on eyes and less elsewhere but it seems less eyes photograph really well. Also received compliment from hubby with less eye shadow so, hmm, something to think of. Check out swatches and looks of Sabrina, Melanie, Karrie and Nadine. 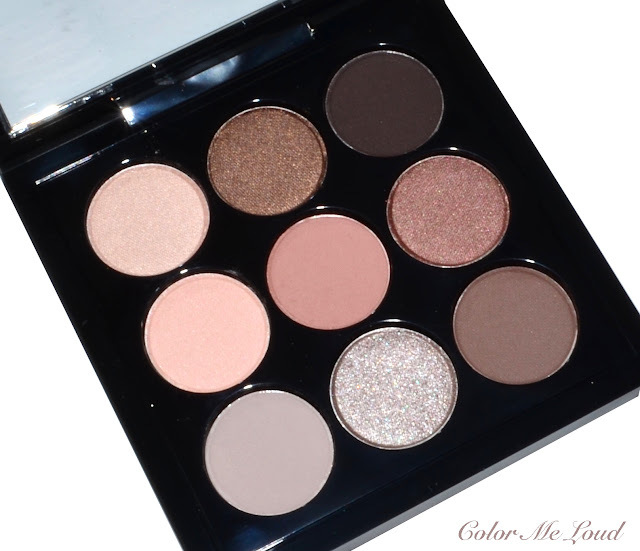 Final thoughts: To me the highlight of the collection is the Eye Shadow Palette x9 in MACneficient Me! Other Items I like are Eye Shadow in Everyone's Darling, Pro Longer Paint Pot in Frozen Violet and Sculpt and Shape Powder in Accentuate/Sculpt. This collection is especially great for deeper complexions and those who are not shying away color. That said, for the natural lovers there are great options as well. Have you picked up anything from MACneficient Me Collection? How would you wear a bright orange eye shadow (other than to Halloween)? Disclaimer: Cheer Me On, Strutting Fabulous and My Inner Femme were sent free of charge for my consideration. The other products were purchased by me. I am not paid for this review. All opinions are honest and my own. I am amazed at how you are able to make the vibrant red and orange work-- and love that look on you. And I did like the Suqqu post too. Very interested to see Strutting Fabulous. I wear those kinds of lip colors too and I was eyeing that one. So very curious to see how it worked. Lavender Jade and that Nars one are really best in class for these types of shades IMHo. And LJ is definitely more pink. I have some Edward Bess blushes that are almost on the wine-lavender spectrum which could help make that work. I feel it's either a tan for contrast or a pale look-- that these work with. But to me that lip color is more Halloween than the orange eye look which is so pretty. That look would also work with that Yellow YSL from last summer. !!! Oh I loved the last orangey look you created! So vibrant and elegant!and your beautiful eyes pop! I was torn whether I should get the palette but then I remembered that I have a very similar but more warm toned from make up for ever so I skipped this one! But I picked Fashion Revival lipstick which I didn't get before and Mattene in Personal Pick! 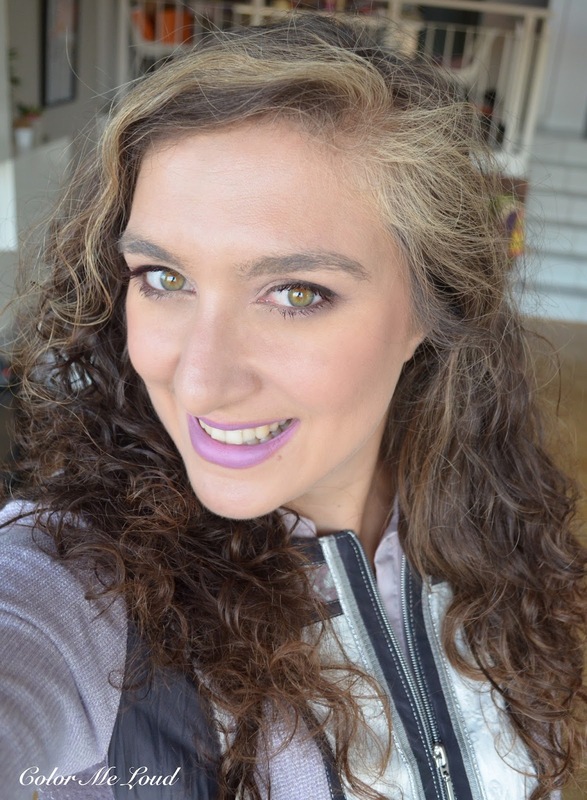 It was my very first experience with the Mattene formula and I liked it very much since It didn't dry out my lips and it was very comfortable to wear! Plus the color is to die for! This palette is so nice, but I'm still debating whether or not to pull the trigger. I have so many neutral palettes at this point, including Entrelacs, which I have to say I LOVE. The softness of the colours works so well for me and makes it a no-brainer, workhorse palette that I can use for any occasion. The only item I bought from the collection was the Eye Shadow x9 palette. I am tempted by one of the nail colors. Considering that MAC nail polish rarely lasts longer than a day on my nails, I doubt I will give in and buy it. Oh I love my Amber x 9 and don't find it hard to work with at all! It's actually my most used palette! I have bought this new one-it's on its way to me now-can't wait! I haven't picked up anything from this collection. But that last look with Cheer Me On looks stunning on you! Especially paired with the red lip and orange outfit. I hope you love yours as well. I wore that palette a week straight, which almost never happens. Super pretty, performs like a dream. Very happy with mine. Hi Alison, thanks so much. I was a little surprised by the fact that orange and red worked on me. I guess without trying you never know for sure lol. I love lilac on lips too but this one was a bit too... don't know cool maybe? I love lavender Jade, works better on me. Nars one is to die for. Yes a good lavender blush would work but somehow I am not wearing them right now in this season. And you wear dense blushes so well. I am still afraid, couldn't bring myself to try those lol. Wow yes that one is a winner! Thanks Hara :-** I was not expecting orange to work on me but together with the orange and red I wear, it somehow looked ok. I think you can safely skip this palette, we all have more than enough similar shades. 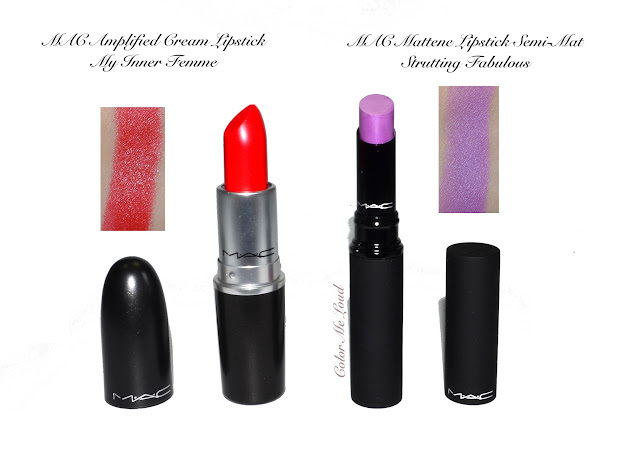 Fashion Revival is so nice, one of my all time favorite MAC Mattes. I was also considering if I should get Personal Pick. It is really a very nice color! I knew you would love Entrelacs. You like soft neutrals and that one is made for you. I have darker eye lids naturally so for something to look neutral on me, I need some definition or it look weird, if you know what I mean. You are right though, the palette is very dupable but still I couldn't resist lol. Hi Tatiana, I think you got the best item from this collection. I also no longer buy MAC nail polishes. These don't last on me either. Hi Stacey, can't wait to see this one on you. Now you made me want the Amber x 9 too, boo! They really hit it with LJ. I at first resisted it because I was mostly seeing it swatched by those with deeper skin tones and then of course it sold out almost instantly. So I did not want to lemming after something impossible that did not work on me, but then I tried a few similar shades and realized it would work. Saw it on evilly-- below cost and pounced. But not a fall shade really.